Users want to know what is required of them and they want a logical, easy to understand, Standard that provides the answers to the questions that they will ask about producing drawings. By developing your Standard based on the Principle that you have developed, you are off to a good start. Here is a graphic that will help you see how principles keep you focused in the right direction. You can move from Chaotic CAD to Destination CAD by trying to stay on track. Drifting to the left will leave you with Ethereal CAD where no one documents the WHAT, and the conversation never moves past the vague discussions of what you should be doing. Drifting to the right will leave you with Despot CAD where the rules are rigid and no one understands the WHY of the rules they are forced to follow. Blending the right mixture of principles and rules will achieve what everyone wants. A solid Standard based on shared Principles. 1 Comment To "CAD Standards based on Principles"
This is bang on. 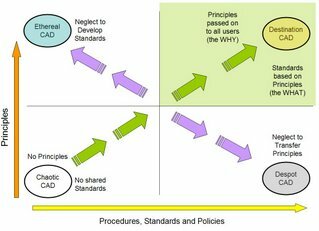 I always try to answer What – When – Where – Why – Who – How when creating protocols and guidelines in the CAD Manual. If I can answer all of these points then I am heading towards Mark’s “Destination CAD” goal. The trouble is, I get draughtsmen moaning at me now if I havn’t answered all the sections. I supose it shows that they are reading them!